Easy chicken dinner alert! 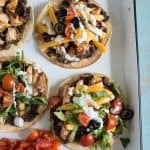 The Best Chicken Tostada Recipe takes 30 minutes to make, includes simple baked tostada shells, and the whole family will love it. Take Taco Tuesday to the next level with this delicious recipe. Tostadas are one of my favorite dishes to get when we go out for Mexican food. I love that crispy shell, beans, and pile of shredded lettuce and salsa. I took it upon myself to figure out the most delicious homemade tostada recipe ever, just for you, and the results are awesome! This easy dish is a fun twist on your classic chicken tacos that will make Taco Tuesday a real party. I know I can’t be the only one who gets stuck in the rut of making normal beef tacos over and over again, they are a classic for a reason. But get out of the rut with this simple recipe and your family will cheer. And the best part? You probably have everything on hand to make them TONIGHT! I also love dishes that the kids can pile on what topping they love and leave off what they don’t. Customizable meals are great for family dinners aren’t they? 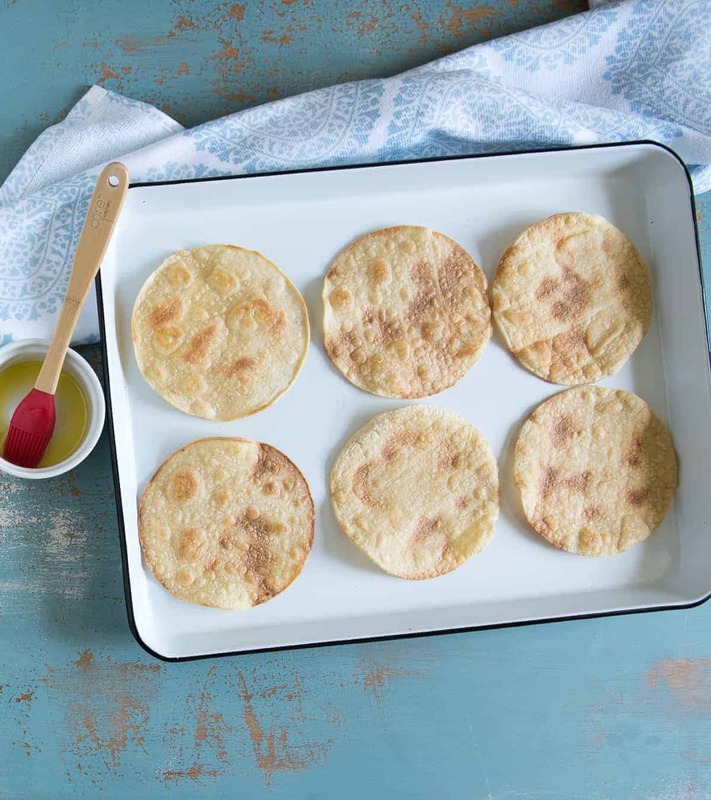 Most tostadas are fried, but you can bake your own at home! You can buy premade tostada shells at some grocery stores but I’m here to tell you that they are super easy to make yourself at home (and really inexpensive). All you have to do it brush a little oil on both sides of a corn tortilla, bake it, flip it, finish baking it, and 8 minutes later you are done! No frying needed. The cooked chicken is one of my favorite recipes. It turns out moist and flavorful every time. Add some beans, a little cheese, and lots of vegetables and you have yourself one delicious tostada that’s on the table in less than 30 minutes. 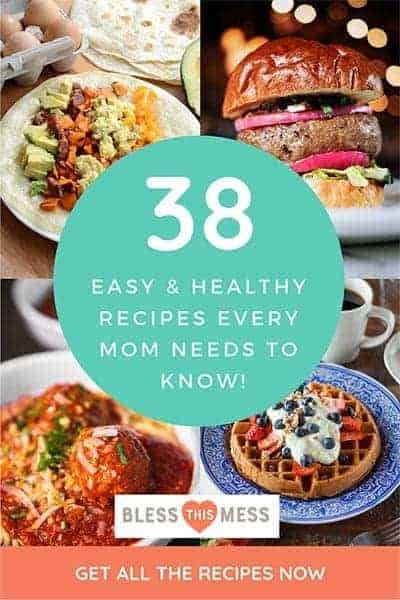 I used boneless skinless chicken thighs for this recipes because they don’t dry out the way that chicken breast can. You can use chicken breast – just be sure to not overcook. You can also grill the chicken if you’d like; it’s delicious that way too. Want to take your beans to the next level? Dump the can of beans (liquid included) into a medium saucepan. Add 1/2 teaspoon each of salt, garlic powder, cumin, and chili powder and stir to combine. Simmer on low for 15-25 minutes, stirring often until the liquid absorbs. About halfway through cooking, use a potato masher to lightly mash the beans and then mash them again when most of the liquid is absorbed. This makes the most delicious homemade “refried” beans ever. Start them when you start the chicken and they’ll be done at the same time. DO IT! Total game changer. Make a double batch and eat on them all week long. Omit the chicken all together for a great meatless meal. OR you can make this awesome Instant Pot Pork Taco Meat and use them for this tostada recipe, so easy! Add all the veggies! We also love homemade ranch and this blender salsa recipe on top. 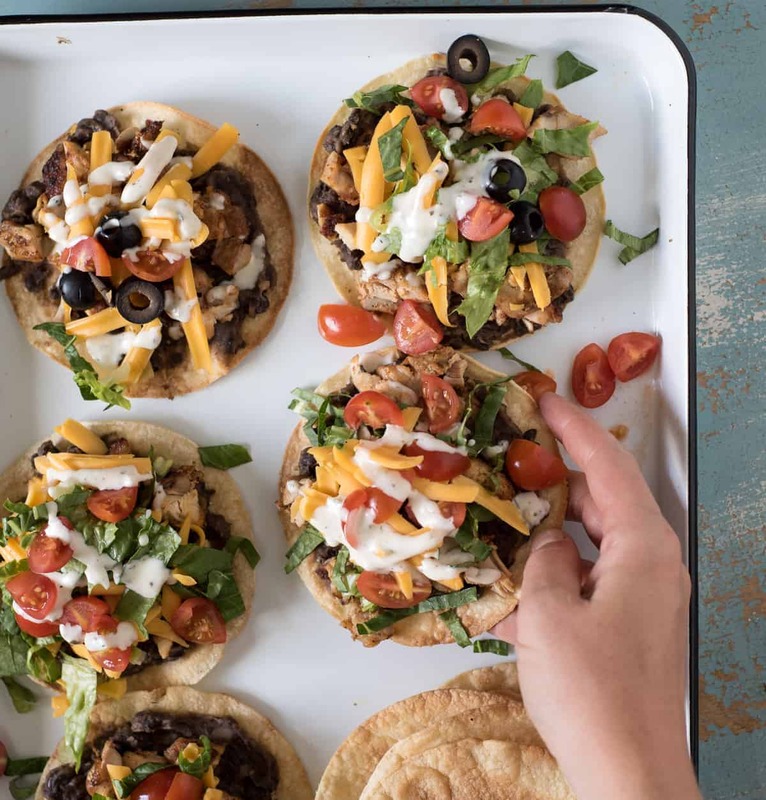 The Best Chicken Tostada Recipe takes 30 minutes to make, includes simple baked tostada shells, and the whole family will love it. Take Taco Tuesday to the next level with this delicious recipe. In a large zipper-topped plastic bag or in a shallow dish, add the chicken, all of the spices, lime juice, and oil. Close the bag and use your hands to mix everything together. If you are using a shallow dish, use tongs to work the spices evenly into the chicken. You can let this rest for up to a half hour or work with it right away. I like to let it rest a minute to increase the flavor. While the chicken cooks, heat the beans. If using black beans, mash them lightly with the back of a fork and add a little water and salt to taste. While the chicken rests, prepare your tostada shells. Brush each side of a shell with oil and place it on a baking sheet (about 6 fit on a sheet). Bake at 400 degrees for 4 minutes. Remove from the oven, flip the shells over, return to the oven, and bake for 4 more minutes. Remove the shells for the oven and allow to cool slightly. The shells will finish crisping up as they cool. Repeat with remaining shells. 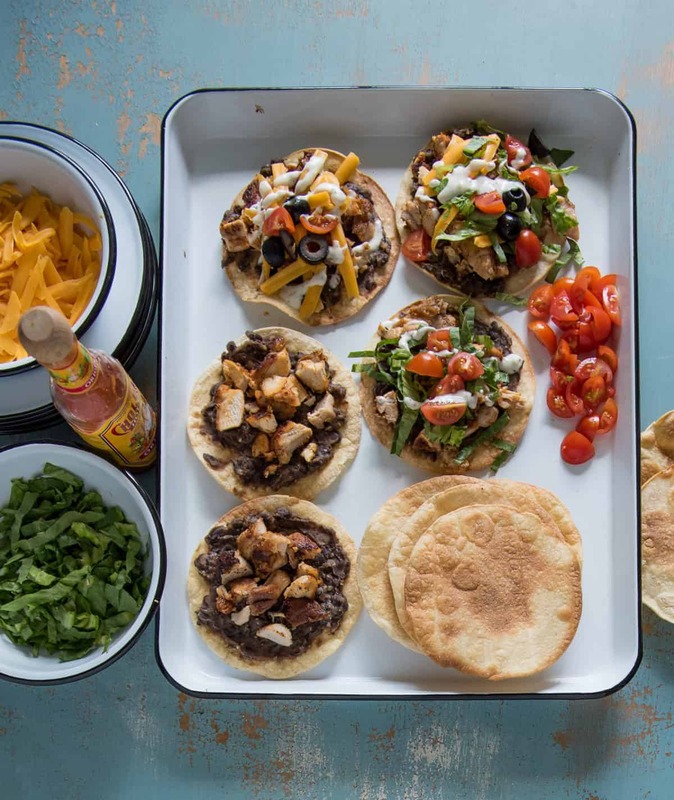 Chop the chicken into bite-sized pieces and prepare your other toppings. 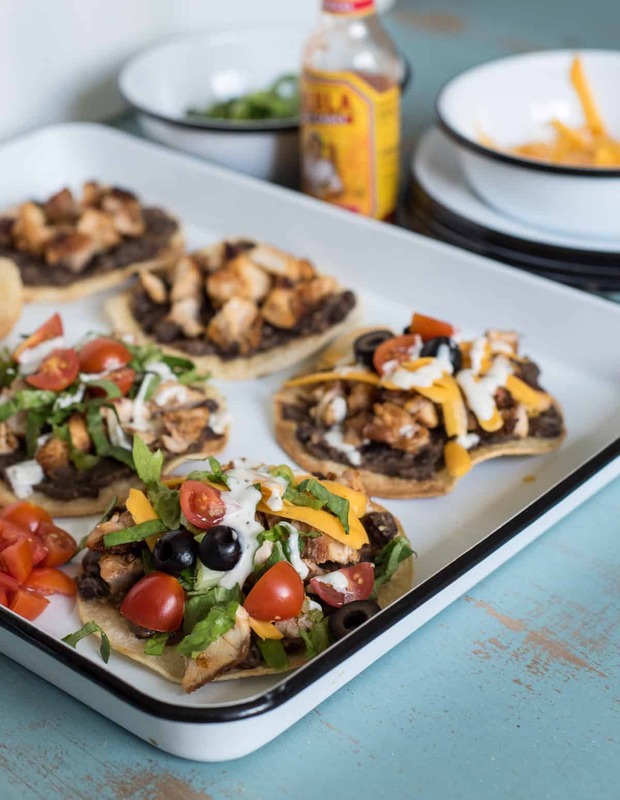 To assemble your tostadas, add a tablespoon or two of mashed beans, a tablespoon or two of chopped chicken and additional toppings to your liking. Eat right away. The shells don’t store well. Just make as many as you need. 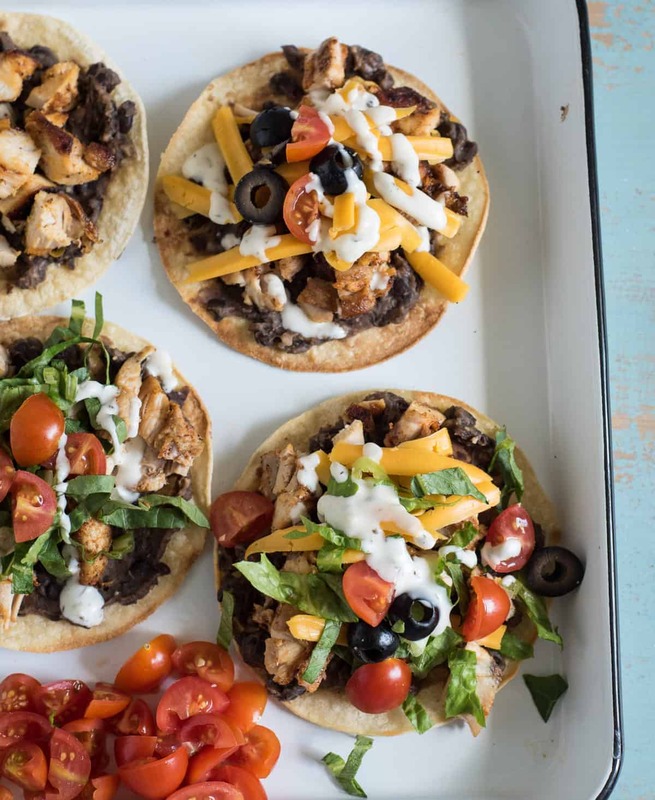 I can’t wait for you to make this simple, fun, and easy homemade chicken tostada recipe. 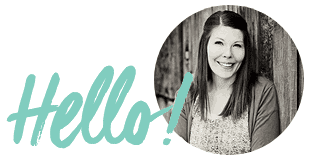 It’s one of our very favorites and I’ve been really excited to share it with you. Be sure to try that tip on the beans in the “tips and tricks” section, too, because they are really, really yummy. These were easy and delicious! My husband tossed the chicken on the grill, so that made it even easier! Next time I’ll add a little salt to the chicken, but other than that, it was great, and my whole family loved it! Win! Thanks Melissa!